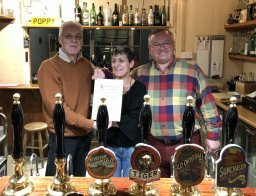 The Shakespeare Branch of CAMRA presents a "Pub of the Season" award to a pub that has promoted real ale, promoted CAMRA and played a part in community life. The award is not normally presented to pubs that have already achieved Good Beer Guide status, but is presented to recognise other pubs within our Branch area. A presentation was made on 30th January 2018 by local Shakespeare Branch member and regular at the Holly Bush, Rhys Williams. Since taking over the Holly Bush, Henley Street, Alcester in June 2017, landlords Peter and Helen have endeavoured to return the pub to its former glory. In recognition of their efforts, the Holly Bush was awarded Shakespeare Branch Pub of the Season for Winter 2017. 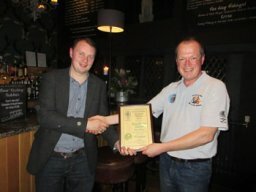 On 29th March 2017, a presentation to mark the award was made by Pete Godfrey, Shakespeare CAMRA Good Beer Guide and Pubs Officer. The Howard Arms is a 400-year-old rambling golden Cotswold stone-built inn, located in the village green. It returned to local ownership in 2015 and has been sympathetically refurbished. It is popular with local people who appreciate well-kept real ales – at the time of the presentation Purity Bunny Hop, Timothy Taylor's Landlord, Hook Norton Old Hooky and St Austell Proper Job were on offer, all served well. The General Manager Robert Jeal was unavailable and the award was accepted on his behalf. 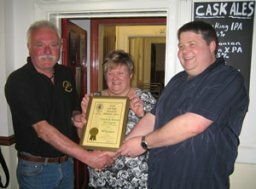 On 30th Aug 2016, a presentation to mark the award was opened by Pete Godfrey, Shakespeare CAMRA Good Beer Guide and Pubs Officer. Andrew and Rachel Danks took over the Lord Nelson 3 ½ years ago. They have certainly turned the pub around and now consistently have five real ales available – always in good condition. They always have a cider available too and there is always a good friendly service from welcoming staff. Andrew and Rachel have put a lot of effort into transforming the interior, which now has welcoming log burner in the winter, and have moved the front door to where a door should be – not round the side. They have also recently extended the outside seating areas. The Lord Nelson is a real locals' local, but also welcomes newcomers. Pete handed over to Alan Whitbread, one of the founding members of Shakespeare Branch of CAMRA and an Ale Taster for the Alcester Court Leet. Alan commended the Lord Nelson for its community activities such as cribbage evenings and vinyl nights, before treating those present to a rendition of 'O good ale thou art my darling'. 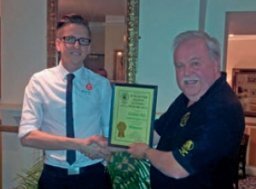 Alan then presented the certificate to mark the achievement to licensee Andrew Danks. 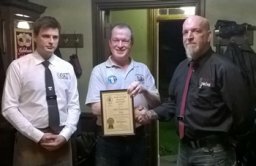 A presentation was made on 11th April 2016 to the Assistant Manager, James Exton by Pete Godfrey, Shakespeare CAMRA Good Beer Guide and Pubs Officer. The Broadway Hotel is a former Pershore Abbey coaching inn dating back to 1575. Having recently been modernised, there is a rich historic interior which has retained a cosy atmosphere. The hotel is split into a restaurant, bar and quiet sitting room. A good range of local beers is available, offering a full style range from light to dark. And if you wish to try four beers, the Broadway Hotel is one of the few places that offers a ¼ pint tasting paddle. Award presented on 6th April 2016 by Bob Kirby. With a somewhat chequered past and after a period of closure The Royal Oak opened again mid May 2014 under the stewardship of Chef Alistair Barlow and partner Stacey. They got off to an excellent start offering three real ales – at the time St Austell Tribute, Wychwood Hobgoblin and Sharps Doombar together with a first class food offering with a promise that the ale choice would be become more adventurous - they stuck to their promise which now sees them with a changing selection far from the norm. The license trade not being an easy one and CAMRA doing its best to encourage pubs to stay open in one format or another means all parties have their work cut out. Fortunately for Alistair and Stacey they seem to have found the right formula with the Royal Oak; An excellent food offering, a pleasant environment to eat and drink, and as far as we are concerned good beer! So for becoming one of only 4 per year - voted as Winter pub of the season 2015 by branch members at a recent meeting, we wish them well and offer our encouragement with the hope they will have a long future here with great success. 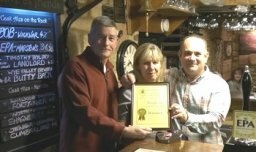 Members of Shakespeare Branch of CAMRA voted the Old Tramway, Stratford-upon-avon as their Pub of the Season for Autumn 2015. 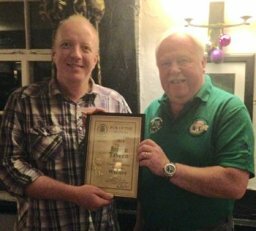 On 1st December 2015, the award was presented to the Bar Manager, Martin (Jim) Tatlow, and Assistant Bar Manager, David Pagan by Pete Godfrey, Shakespeare CAMRA Good Beer Guide and Pubs Officer. Previously at the Salmon Tail, Stratford; the Vine Inn, Warwick; and the Kings Head, Napton, Jim joined the Old Tramway about a year ago. Since then the beer quality has continued to improve and the staff have become very attentive to the customers needs regarding real ale. The Old Tramway also fits in very well with the local community, arranging lots of events such as the regular Tuesday night quiz and the November fireworks display, which was absolutely fantastic and appreciated by many people in the area. The pub was packed with regulars and CAMRA members who were delighted to witness Jim and David accepting the award in recognition of all their hard work in ensuring that the Stratford pub continues to provide high quality real ales and serve the local community. Members of Shakespeare Branch of CAMRA voted the Three Tuns, Alcester as their Pub of the Season for Summer 2015. Having been shut on 29 March 2014 it presented a very dark period in the history of this well known Alcester pub. Many of our members were concerned about the future and many rumours began to circulate. It was then really good news to hear that Mandy Downs and Andy Bown had managed to secure the pub and it re-opened again on 6 March 2015. Mandy was well-known in Alcester, as owner of the Cross Keys. The interior has been enhanced but the character of the pub had not been altered. It was found to be selling a good number of real ales and friendly conversation was still a priority. On 24th November 2015, a presentation was made by Lloyd Evans, Shakespeare Branch Chairman, who commented that he was pleased that the beer quality had remained consistent since the opening and that the choice had been interesting and varied. Mandy and Andy were delighted to be presented with the Pub of the Season award and were really "chuffed and overwhelmed" that their hard work had been so well appreciated. 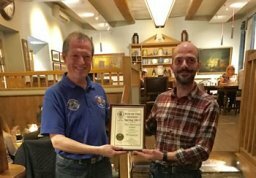 At the May Branch meeting, members of Shakespeare CAMRA voted the Keys and Kitchen, Stratford-upon-Avon as their Pub of the Season for Spring 2015. Matt Homans and Marilyn Herdman invested in a major refurbishment of the old Cross Keys pub, which re-opened in October 2014. The pub was packed by regulars and CAMRA members, who enjoyed a good celebration with snacks provided by the kitchen. 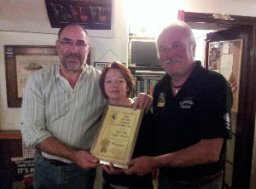 The presentation was made on 30 June 2015 by Pete Godfrey, Shakespeare CAMRA Pubs Officer, to a delighted Matt and Marilyn. The Pub of the Season award for Winter 2014 was presented on Tue 3rd March by Dave Page, Shakespeare CAMRA Treasurer. The Plough Inn is in the heart of the village and it oozes charm and character. First time licensees Steve and Mandy Aubrey, have taken on this former Warwickshire Pub of the Year after a six year search and they have big boots to fill as the former owners had a great reputation for food and ale. They have brought with them a new head chef Christophe Le Saint, who has a pedigree of turning out top food in a number of prestigious Cotswold pubs and restaurants offering a range of superb homemade dishes using local ingredients where possible. The pub received a new kitchen and a face lift and a lovely new white washing on the outside. Serving four beers you'll be sure of a good choice. When several Shakespeare CAMRA members visited, we were not disappointed, on offer were Marstons EPA, Timothy Taylor Landlord, Wye Valley Butty Bach and Wickwar BOB. 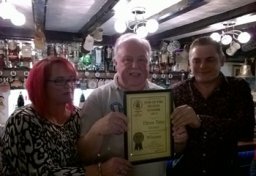 The Pub of the Season award for Autumn 2014 was presented on Thu 27th November by Lloyd Evans, Shakespeare CAMRA Chairman to the thrilled owners, Fritz Ronneburg and Richard Walton. Sharing the celebrations were also regulars enjoying a pint and a bite to eat on a cold November evening. The Tavern was serving four handpulls plus a cider made up of two Purity Ales plus guests. They also make it their aim to use local produce wherever possible. Since The Broom Tavern has reopened, it has gone from strength to strength...from once a uncertain future having closed its doors (with the threat of residential development), to now a thriving community local hub. Great food courtesy of Head Chef Fritz, together with a warm welcome from an attentive team make this 16th century pub a wonderful choice whatever the time of year. The Pub of the Season award for Summer 2014 was presented on Tue 29th July. The Stratford Alehouse opened for business on christmas eve 2013, the first micropub in the Shakespeare Branch area. A member of the Micropub Association, the Stratford Alehouse is a family-run business run by Bill O'Brien, along with general manager Phil Atherton. Serving real ale direct from the cask, the Stratford Alehouse pledges to support local breweries, as well as other breweries not usually seen in the area. Congratulations therefore to Bill and Phil who, after just seven months at The Stratford Alehouse, have been voted Shakespeare CAMRA's Pub of the Season for Summer 2014. 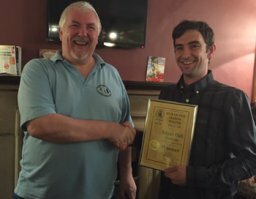 The Stratford Alehouse was packed with CAMRA members and regulars for presentation of the award which was made by Pete Godfrey, Shakespeare CAMRA GBG Officer. Bill and Phil thanked everyone immensely for their continued support. The Pub of the Season award for Winter 2013 was presented on Tue 21st January. Congratulations to Manageress Tammy Montgomery who unfortunately could not be at the presentation evening but her deputy manager Paul Wickett accepted this on her behalf. Shakespeare CAMRA Branch Chairman Lloyd Evans went on to say that Tammy and her team here have over a number of years had great involvement with Shakespeare branch by putting on Wetherspoon Beer festival launch events, meet the brewer nights and even working at the branch's own Stratford Beer Festival. And if they are not busy enough running this town centre pub they can often be found each year raising money for different charities, one of their biggest achievements to date was a cycle ride to Wales and back! Raising money for Clic Sargent & The Dogs Trust - totalling over £2000. So from Shakespeare Branch we wish them every success in their future and continue to welcome their involvement with the branch and applaud their fund raising for whatever they get up to next ! The Pub of the Season award for Summer 2013 was presented on Tue 17th September. 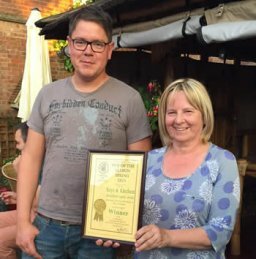 Congratulations to Ian Merivale and Anne Simpkins who, after just 18 months at The Gate Inn, Upper Brailes, have been voted Shakespeare CAMRA's Summer 2013 Pub of the Season. 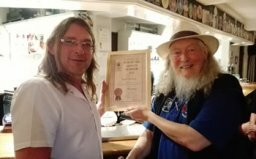 An award certificate was presented by CAMRA's Julian Stobinski in front of an appreciative gathering of branch members, locals and a few passing cyclists who celebrated in style by drinking plenty of Old Hooky, straight from a cask on the bar, (and Weston's Old Rosie Cider). Its sometimes difficult to put your finger on exactly what elevates a pub from 'good' to 'something special'. Great beer is an obvious must and presents no problem as Ian and Anne have plenty of experience running other pubs in the area and Ian has previously brewed commercially, (and still runs a brewing 'master class' for anyone interested). Add to good beer and food, a genuinely warm and friendly welcome, traditional pub games, community services like a 'book swap' and a wealth of local information for walkers and cyclists, (no doubt a result of Ian's years as 'footpaths officer' for Warwickshire) and you're starting to get there. For the final ingredients add a lovely 18th Century local stone building, with timber beams, a real fire set in a stone hearth, set it in the heart of an Area of Outstanding Natural Beauty and put it all just 6 miles from where its beers are brewed. The Pub of the Season award for Spring 2013 was presented by Julian Stobinski on Tue 9th April. First time licensees Di and Steve Salter have been here just 2 years and already there is so much going on. To name a few things: there is a Ukulele, computer and over 50's club, and an annual beer festival. On top of this they have gone on to support events in the community such as the village community orchard. Being one of 2 pubs in the village, this pub has become a thriving hub serving up 3 consistent ales with a good staple regular and 2 changing guests which are chosen in a novel and unique way by the patrons! Di and Steve also gave credit to Neil their cellar man who keeps the beers in excellent condition ensuring a plentiful supply which was evident during the presentation evening where beer sales where very brisk while maintaining a high quality.